I went to the State Cinema on Friday night, this time with a girlfriend who is very knowledgeable (and incredibly interesting to chat with) about history, style and particularly costume – the perfect partner for a film like this! It was a hot night in Hobart and after grabbing some drinks at the bar, we made our way into the cool air conditioned cinema and lost ourselves in Baroque England for the next two hours. One of the first things I noticed was the lighting and the wonderful cinematography by Robbie Ryan. Lanthimos wanted to shoot only with available light and candles, which gives a fabulous softness to the finished movie. They also used 35mm film, rather than go for the crisp, digital look that is the industry standard now. The use of extreme wide-angle perspectives is introduced early but isn’t overdone and similarly with slow motion. For me, this elegantly underlined the surreal nature of the overall work. Shot framing (particularly some of the exteriors) and the use of space in general is breathtakingly beautiful The costumes are equally as fabulous and hats off again to Oscar-winning designer Sandy Powell for another wonderfully inventive film. This film is many things – at once sumptuous, irreverent, surreal, elegant, outrageous, heartbreaking, laugh-out-loud funny and at times, downright bawdy – and I loved every minute of it! Plus, there’s bunnies!!! The sound design is rises and falls as needed but never gets in the way of the excellent script by Deborah Davis and Tony McNamara and the cast deliver it wonderfully. The three female leads Olivia Colman, Rachel Weisz and Emma Stone are engaged in a complex power struggle and all are at the top of their game here. Mark Gatiss, James Smith and Joe Alwyn are great supporting players and Nicholas Hoult is delicious as the bitchy and be-wigged Harley. But at its heart is a stellar performance by Olivia Colman. I loved her in Broadchurch (2013), The Night Manager (2016) and especially Tyrannosaur (2011). 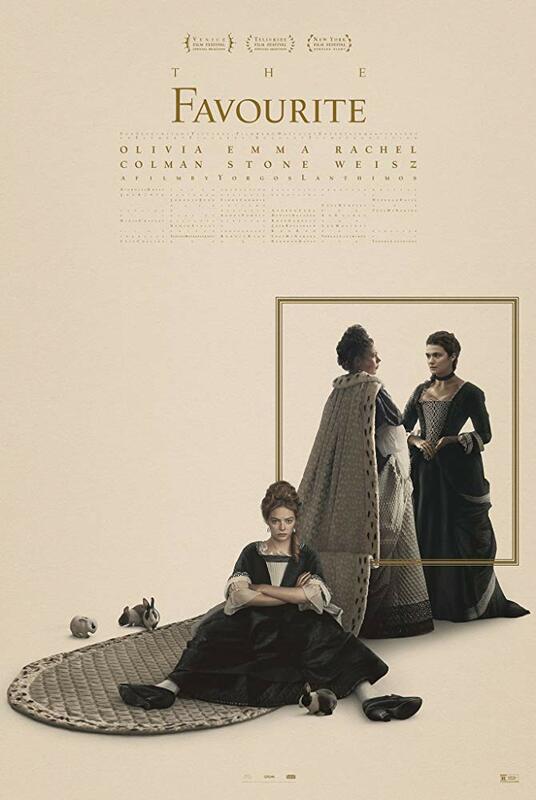 She brings her best to this film, expressing all the complexities and inner turmoil of the ailing Queen Anne on the screen with a power and deftness that deserves ALL the awards. Overall, I think Lanthimos has made his most accessible work to date. This was my first trip to the cinema for 2019 and I suspect I saw one of the year’s best films – it’s going to be hard to top! Go see it on the biggest screen possible.